Note: Before you start, make sure that the discount groups are already configured for your online store. Step1. Launch the Wholesale Hero app and click the Edit button on the discount group that you wish to add the volume discount. In this example, we choose a discount group named Diamond. Step4. Enter an amount in the Cart total amount greater than field. When the customer's total purchase has exceeded the amount that you specified in this field, the customer can avail of another set of discount. In this example, we use 1000. Step5. 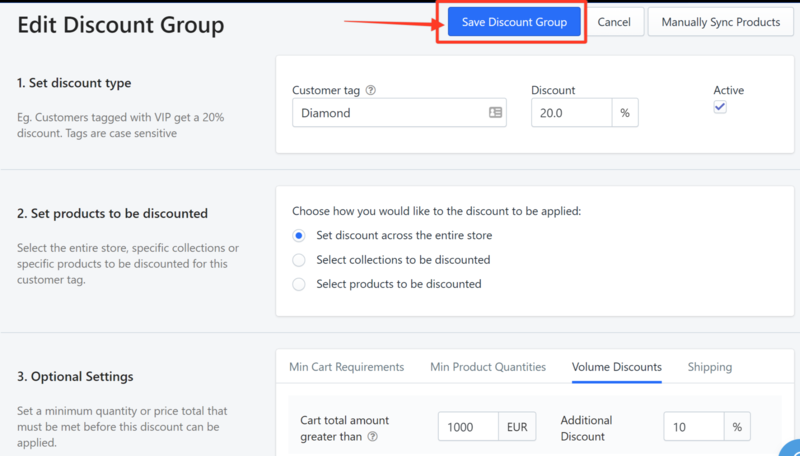 Specify the discount percentage in the Additional Discount field. In this example, we use 10%. Step6. (Optional) If you want to add multiple discounts, click Add another discount tier and repeat steps 4 and 5.